This is one of the easiest, tastiest ways to impress guests for a dinner party, or simply have leftovers that can be made into countless other dishes. My go to’s: chicken salad, curry, soup, enchiladas. The possibilities are endless! Start out by preheating your oven to 400F. To prepare your chicken, you will probably have to start by grabbing the goodies out from the cavity of the bird. Yep, if that sounds gross to you, that’s ok, I also used to be pretty icked out. I like to take the bag that you brought the chicken home in as a make shift glove. If you don’t plan to use the giblets (chicken organs) this bag method is extra helpful because it allows for an easy, clean disposal. Rinse the bird with cold water and dry thoroughly. The drier the skin, the crispier the skin. Place in your pan of choice. You could put them straight into a glass Pyrex or on a sheet pan, just be sure to use something with a lip. Nobody wants chicken juice burning to the bottom of their oven. I trussed only one of the chickens to see how much of a difference it would make in the moistness of the meat. Check out this easy trussing tutorial. if you are interested. 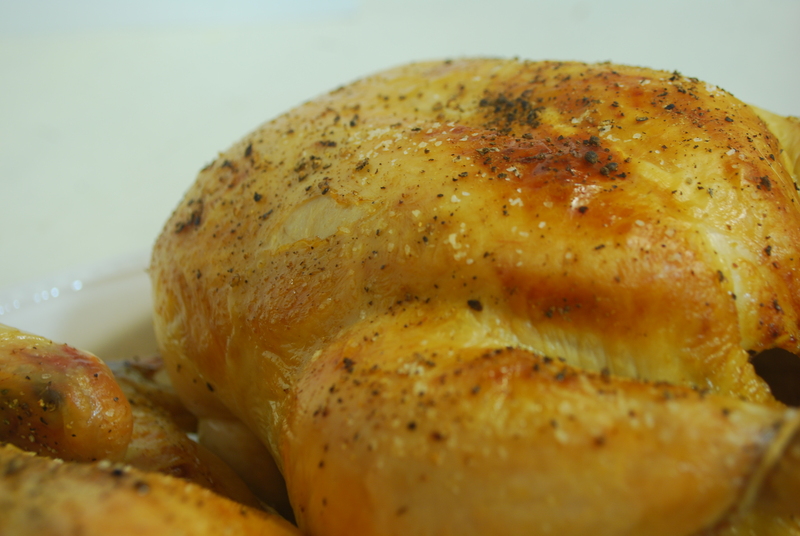 I found that trussing really plumps up the breast and keeps it moist, but the legs were not able to brown as nicely. So, all in all, it is not a crucial step. Generously sprinkle salt on both sides of each chicken and crack black peppercorns all over. You can add any herbs that sound good to you, but it is not necessary. I find the best herbs to use with chicken are thyme and rosemary. Some recipes call for you to rub butter or olive oil on the chicken, but there is no need for that, chicken have fat of their own. If you add extra fat, that will create extra moisture, and extra moisture means a less crispy skin. And let’s be honest, the salty, crispy skin is the best part, right? Stick in the oven for about an hour. This time will range depending upon the size of your birds and how close to your oven’s heating elements you place the pan. So just keep an eye on it to see when your chicken is golden brown and the internal temperature reaches 160F, or the juices run clear. This accounts for a crazy little thing called carryover cooking, meaning your meat doesn’t stop cooking the second you take it out of the oven. It actually continues to cook itself for a few minutes because it has held on to that heat. Here is a general guideline from the Food Network, and those guys know their stuff. Mmmmmmm, perfect golden brown skin, how I love thee. Yes, I love my food, and you should too, it’s going into your body for goodness sake. After it has rested for 10 minutes or so, carve it up and serve with anything else you feel like. I roasted some delicata squash exactly the same way I roasted acorn squash and it was even more buttery and delicious. 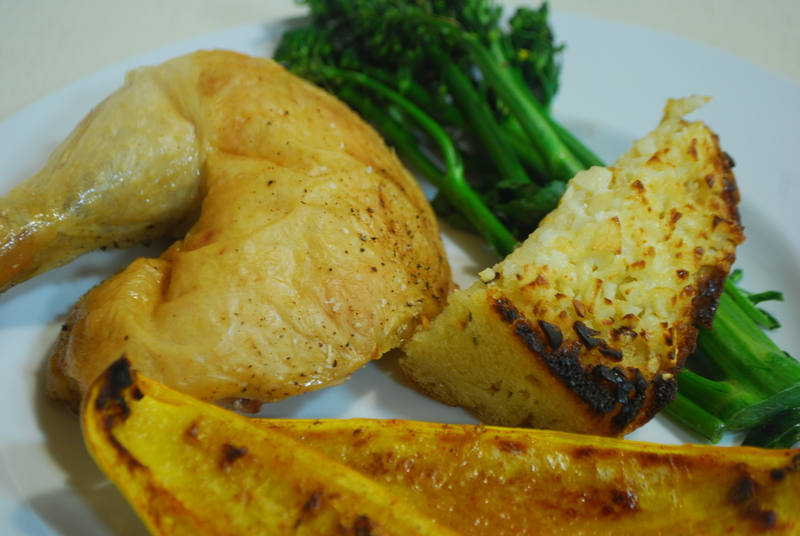 Stay tuned this week for some great dishes using our leftover chicken!